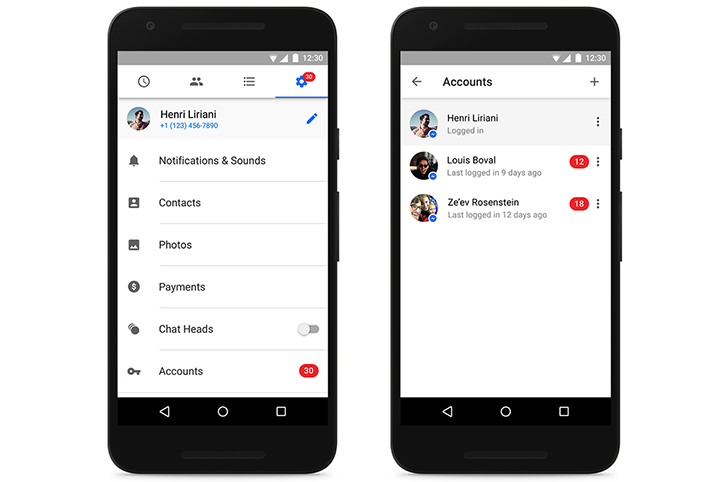 Earlier this month, we reported the news that Facebook seemed to be testing multiple account support in its Messenger application on Android. The feature had been turned on for beta testers and some non-beta testers as well, likely to iron out some quirks and bugs before being officially rolled out to everyone. Now Facebook is ready to make the feature available for all. The Messenger team announced that multiple accounts are now live on Android under Settings > Accounts, and explained that this should make it easier for multiple members of the same family to use a single device to access all of their chats. It should also be a welcome addition for those who manage multiple work/personal accounts, or who have dedicated pages to take care of. However, being accessible on the same account doesn't mean that anyone can read and reply to everyone's messages. Facebook has implemented a privacy feature to circumvent this. First, users can only see the number of unread messages on another account, but they can't read them. To do that, they need to switch to that account and that means inputting the password the first time and choosing whether or not to require it for each subsequent switch. That's a thoughtful setting since it allows fast and easy switching for those who want it, and privacy for those who prefer that. The setting doesn't appear to be live for me yet on the latest Messenger 58.0.0.44.78, but it should be a server-side triggered change or a small update from this version. Download the app from the Play Store or keep an eye out for it on APK Mirror and hope for the best. If not, be patient.